Strip mine • Environmentalists chain themselves to heavy equipment at the Tavaputs Plateau site in southeast Utah. 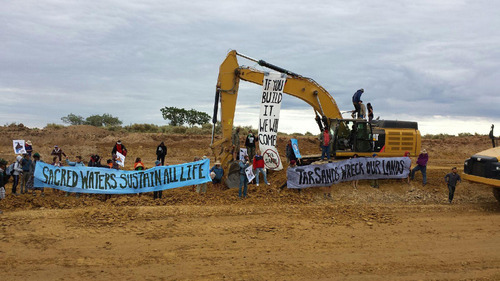 Courtesy | Steve Liptay/Peaceful Uprising Climate Justice activists halt mining operations and road construction at the first US tar sands stripmine, located in Eastern Utah. Courtesy | Steve Liptay/Peaceful Uprising Climate Justice activists halt mining operations and road construction at the first US tar sands stripmine, located in Eastern Utah. | Steve Liptay/Peaceful Uprising Protesters on Monday stopped work on a road to serve a tar sands mine in the Uinta Basin, some of them duct taping themselves to heavy machinery. 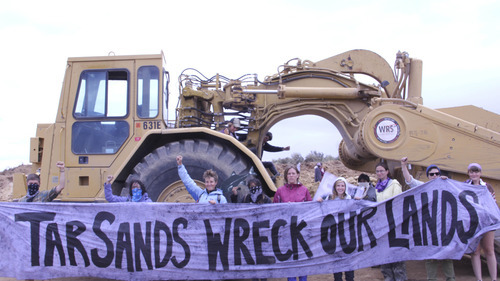 Several environmental groups protesting tar sands development in the Book Cliffs region of southeast Utah stopped work Monday on a road that will serve a strip mine to be operated by Calgary-based U.S. Oil Sands. Celia Alario, a spokeswoman for Canyon Country Rising Tide and Peaceful Uprising, said dozens of protesters had peacefully stopped road building on Seep Ridge Road and also interrupted mining operations at the East Tavaputs Plateau site. 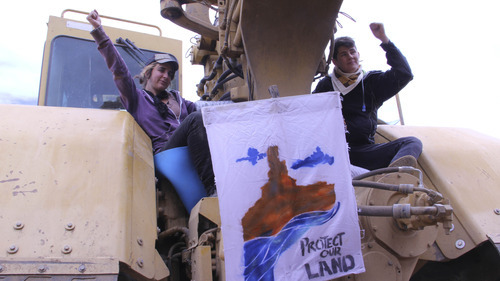 Protesters surrounded heavy equipment and, in some cases, chained themselves to it, she said. No one was arrested or cited, said Uintah County Chief Deputy Sheriff John Laursen. He confirmed that 50 to 60 protesters halted road work and, for a time, closed the county road. "Mostly we just wanted to make sure no one got hurt," Laursen said. The CEO of U.S. Oil Sands said his company is not building the road. It does, however, have a small test mine at the site but is not now producing oil. In a telephone interview, Cameron Todd said the oil sands mining operation is scheduled to ramp up in 2014. The protest came after a week-long training camp that brought environmentalists to Utah from around the region for instruction in nonviolent, civil disobedience, according to a statement released by the organizations. "The devastating consequence of dirty energy extraction knows no borders," said Emily Stock, a Grand County resident and organizer with Canyon Country Rising Tide. "We stand together to protect and defend the rights of all communities, human and non-human." The U.S. Oil Sands CEO said he would not respond to the environmentalists&apos; claims. "There is a [county] road contractor that is using our site as a staging area," Todd explained. "I feel sorry for the contractor." Uintah County had long planned improvements on Seep Ridge Road, said Cheri McCurdy, executive director of the county&apos;s Transportation Special Service District. Public hearings on the Environmental Assessment were held in May 2009. The BLM gave approval for the road expansion in 2011. The road will serve the general public, ranchers, recreationists and energy companies, she said. U.S. Oil Sands has received all the required regulatory permits to mine for tar sands in the region, according to a spokeswoman for the Utah School Institutional Trust Lands Administration (SITLA), which is leasing the land to the Canadian interest. "They are generating money for public schools," said Deena Loyola. "That&apos;s our legislative mandate." Currently, tar sands from mining operations in Alberta, Canada, are being refined in Salt Lake City by Chevron Corp.
Members of the environmental coalition have not planned any activities for the remainder of the week, Alario said. But they do expect to organize future protests on the East Tavaputs Plateau, and other energy extraction sites.